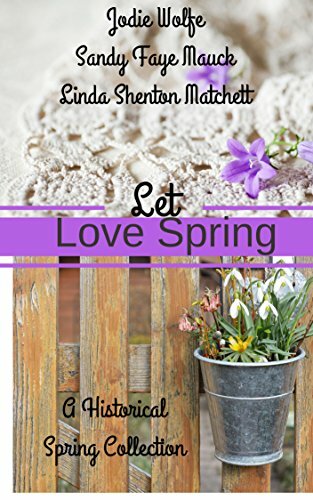 Let Love Spring is a delightful, warm collection of three Christian historical romances. All with their unique tales but very similar themes. All three stories will warm your heart and speak to your soul. A perfect collection for an afternoon’s light reading. An Angel For The Cowboy by Jodie Wolfe has a warm family feeling that simply exudes from the story. There is the theme of putting others first reminding the reader of the Naomi and Ruth story in the Bible. Eldest sister Essie will go to extraordinary lengths to protect and nurture her sisters. The theme of hospitality is also present as the sisters open their home to a stranger. Family is important. Without it, it feels as if something is missing. A delightful story to kick off the trio. 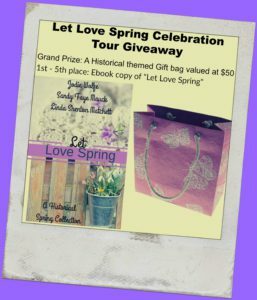 Spring Recaptured by Sandy Faye Mauck will envelope the reader in warmth and love. There are wonderful scenes involving five year old Cathryn whose childish mannerisms and way of speaking have been perfectly captured by Sandy Faye Mauck. The story has the theme of forgiveness. We have all been forgiven and therefore must forgive. In our own strength this may be hard, we need to have God’s help to achieve the impossible. Secrets have the power to destroy. Sooner or later one must stop running and bring into the light, that which was hidden. Love exudes from the pages and the reader cannot help but smile at the touching scenes. The love of a parent is protective, encompassing and nurturing of their offspring. This is a reflection of God’s love for us. Spring Recaptured was a most delightful read. It spoke to my soul and warmed my heart. A wonderful tale. A Love Not Forgotten by Linda Shenton Matchett is set in England in 1946 when everyone is suffering the after effects from the war. None more so than injured servicemen. Not all injuries are visible, PTSD was hidden but an awful condition creating much suffering. The good news is that even if we are hidden from ourselves, God knows us and in Him we can have a new start. There are the themes of faithfulness and loyalty applying not only to God but to people as well. War can make people bitter. They have been robbed of life and of others. These hurts need to be handed to God who can make all things new and give us new hopes, dreams and a future. With the dual themes of prodigals and the Ruth and Naomi theme, A Love Not Forgotten is a wonderful read focusing on the steadfastness of God and the love of family and friends. A perfect read. A wonderful trio of stories to brighten any day. Looks like a great book. Thanks for sharing. What a sweet review. Thank you. Thank you, Julia! love when someone sees my heart in the work I have done.